Used as electrolytes, room temperature ionic liquids would suffer from their absorbed water, due to possible water electrosorption on the electrode. A strategy that could minimize such effect is to choose the hydrophilic rather than hydrophobic ionic liquids. Room temperature ionic liquids (RTILs) consist only of cations and anions, remaining liquid at room temperature. Owing to their exceptional properties, such as low volatility, excellent thermal stability and wide electrochemical window, RTILs have recently become an emerging class of ionic materials. However, the hygroscopic nature of RTILs could “trap” water during the synthesis or fabrication process, so that complete removal of water from RTILs is not easy (even nearly impossible). 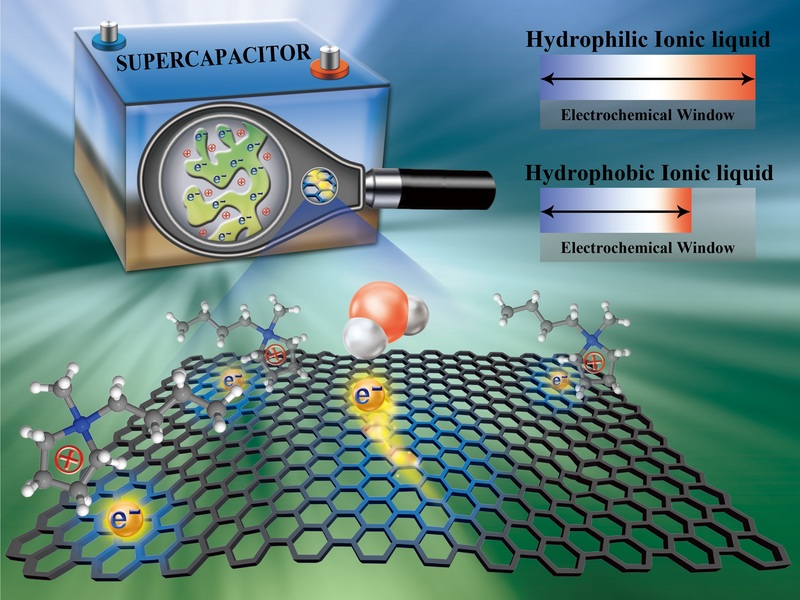 The “trapped” water was predicted, by our previous work, to tend to accumulate at the charged electrode surface, which could lead to water electrolysis on the electrode. Thus, the electrochemical window of RTILs would be reduced, which will eventually become a big issue for many applications with RTIL-based electrical double layers (EDLs), such as lithium batteries, solar cells, electrowetting, electrocatalysis, RTIL-gated field-effect transistors, and electrochemical sensors. To address such an issue, in this study, we performed molecular dynamics simulations, with gold and carbon electrodes in typical RTILs, to investigate the electrosorption of water on electrodes with humid ionic liquids, based on the hydrophobicity and hydrophilicity of RTILs. We study the effects of hydrophobicity/hydrophilicity of ionic liquids and electrodes on interfacial distribution of ions and electrosorbed water. Results disclose a counterintuitive phenomenon: in spite of the fact that hydrophilic ionic liquids could absorb more water from the humid air than hydrophobic ones, taking them as electrolytes would help to keep water molecules away from the negatively charged electrodes (where the danger of water electrolysis is the highest), even at large electrode polarizations. This conclusion is verified by electrochemical cyclic voltammetric measurements on gold and carbon electrodes in contact with humid ionic liquids. Both simulation and experiment show that such conclusion holds regardless of the electrode materials as well as different hydrophobic and hydrophilic ionic liquids. We understand these observations by quantitatively analyzing the energetics of water interaction with its surroundings (i.e., RTIL and electrode). Based on the simulation-obtained water distribution that shows where water is, we calculated the potential of mean force (PMF) on water as a function of the distance from the electrode to reveal why water should be there. In particular, PMF curves exhibit a negative free energy for water near electrode surfaces, except for water incorporated in hydrophilic RTILs at the negatively charged surface (in such region PMF has a positive free energy). The negative free energy would result in an accumulation of water while the positive value indicates that water would be depleted, which could account for the phenomenon that hydrophilic rather than hydrophobic RTILs could protect the electrode from the water electrosorption. Therefore, our findings and analyses could provide guidelines for minimization of water electrosorption on electrodes with humid RTILs as electrolytes. 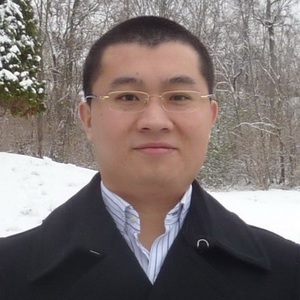 Guang Feng is a professor in Huazhong University of Science and Technology. He received his Ph.D. degree in 2010 from Clemson University, USA as the Outstanding Student in the Doctoral Degree Program awardee in Department of Mechanical Engineering. During 2010 to 2014, he worked in Vanderbilt University and The Fluid Interface Reactions, Structures and Transport (FIRST) Energy Frontier Research Center as a postdoctoral research associate and then a research assistant professor. By the end of 2013, he became a professor in State Key Laboratory of Coal Combustion and School of Energy and Power Engineering in Huazhong University of Science and Technology, China after he was awarded by Hubei Provincial 100-Talents Program. He has published 3 book chapters and more than 60 papers in peer-reviewed journals (e.g., Nature Communications, Advanced Energy Materials, ACS Nano, Nano Energy, Nano Letters, etc.). His current research interests are focused on study of micro-/nano-scale interface and energy/mass transport phenomena in applications of energy storage, shale gas/oil and capacitive deionization for desalination and water treatment. Since 2018 he serves as an editorial board member of ChemElectroChem. More information can be seen at http://ITP.energy.hust.edu.cn.